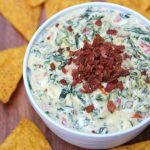 Cheesy Spinach and Bacon Dip loaded with spinach, bacon, cheese, and turkey bacon. All I can say it YUM!! Add all ingredients to slow cooker. Cook on low for 4-6 hours or on high for 3 hours. Stir every hour. Turn slow cooker to warm once all ingredients are well combined.